In Trammel biglukee takes the top spot on both the Single Battle scoreboard and the Overall Total Scores board, pushing Blackemy back to 3rd on the single battle and Donica to 2nd on the Overall Total Scores. On the Overall Total Scores board all the top three players have in excess of one million points! Most impressive. In Felucca the single scoreboard has not changed, on the overall total board Sikkra has overtaken Blackemy to take 3rd. There was no change to the Arena Leaderboard this week, but your sports reporter would like to acknowledge with thanks the assistance of Maarken in reaching the destination to check it. This week on the Single Score leader board in Trammel we find that biglukee has slipped back to second with Blackemy moving up from third to take the top spot. There are 91 names on the leaderboard in all. In Felucca biglukee maintains the top spot with the total number of names increasing from 5 to 11. Has Oceania not heard that the Felucca pool gives double points? Arena rankings remain unchanged this week. The Sports Report listing high scores at the Void Pool and the Arenas has been updated with information gathered several hours ago today. You may find a copy here. In both Trammel and Felucca, biglukee stands at the top of all four of the Void Pool scoreboards for Best Single Battle and Overall Total scores. At the Arenas, the top 10 Survival ratings remain unchanged from last week; however, the top 10 Team ratings have all increased from last week. If you’d like to take a look at the reports for other shards, go to UO Stratics *New* | Global Sports Reports. There are links on the right side of this Global Reports page to jump you to the report for a specific shard. Santa Claus To Visit Oceania. 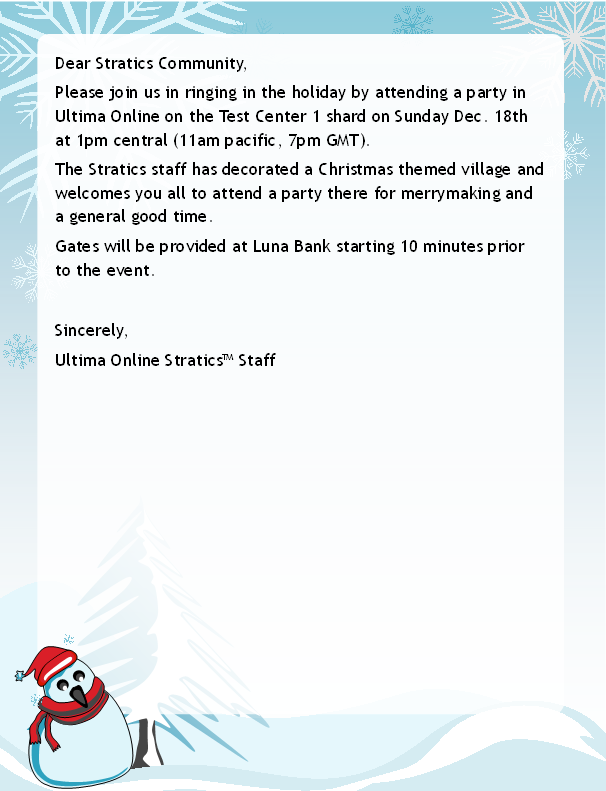 The Stratics Santa will once again be visiting Oceania on his world tour. This year he will arrive in Luna at approximately 7pm on Wednesday 21st December. Please be patient with the old fella, not only is he getting on a bit in years, but he’s got an absolutely dire ping from the North Pole. Have you been naughty or nice? Find out this Wednesday. Are your shoes worn thin from traveling from town to town? Is your voice hoarse and sore from speaking with citizens across Britannia? Have a knack for putting pen to paper and writing an excellent story? Then perhaps UO Stratics’ Oceania News Page is the place where you can not only show off your talent but also help bring the community together with interesting, exciting stories and news items about the Oceania Shard and it’s citizens. Does the above describe you? Then what are you waiting for??? Apply… right now… do not hesitate! Please send an e-mail to [email protected] with “Oceania Reporter Application” as the subject and you will be sent a Reporter Application form to fill out. Good luck to all applicants and thank you for applying!